March 18, 2015 - Boeing has begun several months of flights with its ecoDemonstrator 757 to evaluate new technologies to improve commercial aviation's efficiency, reduce noise and carbon emissions. Boeing is collaborating with TUI Group and the National Aeronautics and Space Administration (NASA) on ecoDemonstrator 757 tests. The 757 flight tests continue the ecoDemonstrator Program's multi-year effort to accelerate testing, refinement and use of new technologies and methods that can improve aviation's environmental performance. "The ecoDemonstrator 757 furthers our commitment to accelerate innovative technologies for current and future airplane programs," said Mike Sinnett, vice president of Product Development, Boeing Commercial Airplanes. "The Boeing ecoDemonstrator program is focused on putting new, more environmentally efficient technologies and airplanes in the hands of our customers sooner." On the left wing, Boeing will evaluate technologies to reduce environmental effects on natural laminar flow as a way to improve aerodynamic efficiency. 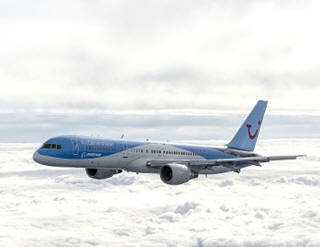 As an example, the ecoDemonstrator 757 will test a Krueger shield that can protect the leading edge from insects. Boeing is under contract with NASA's Environmentally Responsible Aviation (ERA) Project to test two technologies on the ecoDemonstrator 757. On the right wing, NASA will test bug-phobic coatings to reduce the residue left by bug strikes on the leading edges of aircraft wings; the goal is to enable more drag-reducing laminar flow over the remainder of the wing. On the vertical tail, NASA and Boeing are testing active flow control to improve airflow over the rudder and maximize its aerodynamic efficiency. Based on wind-tunnel testing, active flow control could improve the rudder's efficiency by up to 20 percent and may allow for a smaller vertical tail design in the future. TUI Group, the world's largest integrated tourism group, is collaborating with Boeing as a way to reduce carbon emissions. The Europe-based company, which includes six airlines, is preparing for a low-carbon future by reducing its environmental impact and encouraging its suppliers and customers to do the same. "We are very pleased to partner with Boeing for the next phase of their ecoDemonstrator program, as TUI Group is highly committed to achieving further environmental efficiency across our whole business and remaining the industry leader on carbon efficiency with our airlines," said Jane Ashton, Director of Sustainability, TUI Group. With the exception of Boeing proprietary technology, NASA knowledge gained in collaboration with Boeing from ecoDemonstrator research will be publicly available to benefit the industry. "Having a relevant test bed, like Boeing's ecoDemonstrator, to help mature technology concepts is extremely important to NASA's Environmentally Responsible Aviation (ERA) Project," said Fay Collier, ERA project manager, NASA. "Our researchers have been working hard to develop technologies to reduce airplane fuel consumption, noise and emissions. Being able to prove those concepts in flight tests gives them a better shot of getting into the commercial fleet." Later this year, Boeing will announce additional tests with the ecoDemonstrator 757, which was leased for testing purposes. After the flights are complete, Boeing will work with the Aircraft Fleet Recycling Association and the lessor, Stifel's aircraft finance division, to recycle the 757 using environmental best practices. Since it was launched in 2011, the ecoDemonstrator Program has tested more than 40 technologies with a Next-Generation 737 and a 787 Dreamliner.